From a distance, you aren’t sure just what you’re looking at, or what it might be doing on the lawn of the stately Taft Museum of Art. Is it moving? No, but your eye might trick you into thinking so. Is it…alive? Not exactly. It’s six tons of willow tree saplings bent and shaped together, making a kind of swirly wooden Stonehenge with a side of Blair Witch. 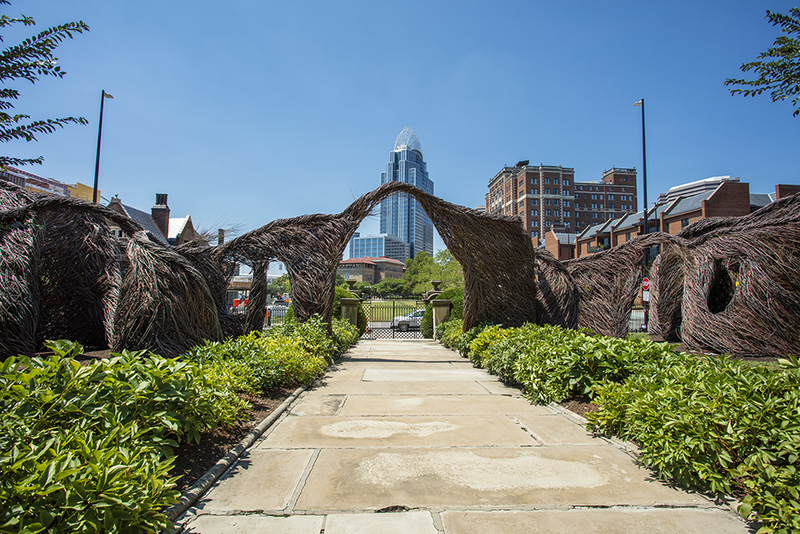 The outdoor exhibit is called Far Flung, and its creator, Patrick Dougherty, has built hundreds of similarly fantastical works all over the world. Dougherty’s sculpture, which he installed in April with the help of 150 local volunteers, will be on display at the Taft for 18 months to two years, depending on how long it remains intact. Visitors are allowed to explore and even touch the sculpture during Museum hours, and it’s a fun, free way to get a good look at some public art and an up-close view of the historic Taft building itself. Even though interaction is encouraged, walking right in its midst—creeping among its twists and turns behind the tall, secret garden-style iron gates of the Taft’s front lawn—still feels slightly illicit. But that’s half the fun. The other half? Imagining that you live in an oversized Hobbit house in the middle of downtown Cincinnati.